Who needs a mouse pad? Cordless mice are wonderfully handy for using your laptop around the house and on the road. And wherever you set up, laser mice can work great on a variety of unusual surfaces, from the fabric on the couch to the jeans on your leg. But traditional lasers just don't work well on some common surfaces, like high-gloss desktops or glass-topped tables. Enter the new Logitech Performance Mouse MX and Anywhere Mouse MX, with Logitech's Darkfield laser tracking -- Instead of depending on the texture details of the surface, Darkfield uses an invisible infrared laser that detects microscopic particles and micro-scratches on surfaces, so it even works on glass or transparent plastic. Both of these mice feature Logitech's sculpted designs to naturally fit the hand, with a flexible scroll wheel and multiple additional thumb buttons for rapid scrolling, web browsing, and application switching. The Performance Mouse MX is full-sized, with a scooped right-handed shape, for $99.99. It uses a single rechargeable AA battery, and recharges through USB. The Anywhere Mouse MX is the compact portable version that runs on two AA batteries (or just one in a pinch), for $79.99. The scroll wheel can be switched with a button press between precision click-to-click scrolling and hyper-fast scrolling to zip through long pages with a single spin. It also tilts left/right to scroll horizontally. On the Performance MX, the wheel presses to work as a middle button, and there's a Zoom thumb button that works while spinning the wheel. Both mice have Forward / Back thumb buttons for actions like navigating your web page history or browsing folders, and an Application button to view open windows, or Expose on the Mac. 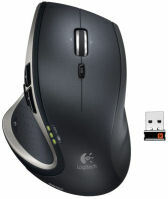 However, the advanced functions require installing the Logitech SetPoint software -- so you won't be surprised by accidentally pressing a button as you are getting used to the mouse. Finally, these new mice use Logitech's new Unifying wireless receiver, which can work with up to five other compatible Logitech keyboards and mice. The receiver itself is tiny and protrudes only a quarter inch from the USB port, so it can be easily left in your laptop. 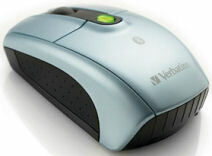 See my Peripherals and Accessories Gallery for more on mice and other peripherals. Apple Sees the Light: iPod nano Gets Camera, Speakers, Mic, FM Radio ... and Pedometer! The power of the Apple iPod brand starts with the lust-inducing designs -- slim, sleek, smooth -- and simple. The iPod line has avoided the feature check-list competition of other players, as Apple has continued to reject even useful features like voice recording and FM radio, requiring consumers to turn to third-party add-ons. But over the years, Apple has begrudgingly accepted that consumers like these additional functions, adding features including a color display, photo and then video playback, and built-in games and other extras. Beyond these new options, Apple added further complexity to the interface with innovations like the Cover Flow view and Genius automated playlist creation. Similarly, the simple iTunes music organizer has extended far beyond audio to manage and sync photos and videos, as well as calendar and contacts. Even so, the iPod designs were still sleek and pure, with display and click wheel, and minimal other buttons or controls -- and a smooth back unmarred by the ugliness of a removable battery. But the purist white / silver / gray colors have been falling to consumer enjoyment of brighter vibrant shades. And then came Apple's annual September iPod line update last week (see post from last year), in which Apple saw the light of consumer demand and has just piled on the features for the iPod nano. The announcements started with lower prices for more capacity, including a lower-end iPod shuffle at $59 for 2 GB of storage (in addition to 4 GB for $79 -- see previous post), an updated iPod classic bumped up from 120 to 160 GB for the same $249, and an updated iPod touch with 8 GB dropped from $229 to $199, 32 GB from $399 to $299, and a new 64 GB for $399. Between the four iPods, different capacities, and color options, Apple now has more than 30 models! But the big change is the new iPod nano, now in its fifth generation. It starts with a larger display (2 to 2.2 inches) in the same sleek and light package, and still in the same capacities -- 8 GB for $149, and 16 GB lowered from $199 to $179. Then come the new features, starting by matching now-common ideas -- FM radio reception, a microphone for voice recording, and a speaker for listening without headphones. But in Apple's implementation, the FM radio not only displays station and song information, but also has Live Pause to hold or rewind playback 15 minutes, and iTunes Tagging to remember songs to review and buy in iTunes. But the big news is the video camera, so your portable player becomes a pocket camcorder that shoots full standard-definition video (but still not photos). And Apple has added 15 real-time effects, including sepia, film grain, thermal, motion blur, and twirl, so you don't need to do any editing before you share clips to online sites. Unfortunately, the camera lens is located on the lower back of the player (on the other side from the click wheel), which requires careful hand positioning when shooting videos. Not content with common features, Apple also added a pedometer to the nano, with an accelerometer to track your steps for analysis of calories burned. You can wear it in your pocket or on an armband, or integrate with the Nike+ shoes (previously used with the iPod touch). Finally, Apple has added VoiceOver from the iPod shuffle, to speak the song title and artist when you press the center button. And with the new iTunes 9 it expands the Genius feature to automatically find interesting music, with Genius Playlists for similar songs and Genius Mixes from the iTunes library. The iPod nano still looks slim and sleek in vibrant colors, but as the features have piled on it can no longer can really be called simple. For example, the iPod nano User Guide (PDF) is 103 pages, with 15 pages on the basics, including a table of 43 common actions with the controls. See my Portable Media Players Gallery for more on the iPod line -- and a iPod Product and Pricing History. SanDisk Extreme Pro CompactFlash Cards - Shoot up to 64 GB at 90 MB/sec. Today's high-def camcorders and higher-res digital cameras require not only greater storage, especially for shooting in less-compressed RAW formats, but also faster performance, especially for burst-mode shooting of sequential images in fractions of a second. So even consumers can see the need for memory cards like the recently-announced SanDisk Extreme Secure Digital (SD) Cards, with up to 32 GB of storage and running at up to 30 MB/sec. read/write data rates (see previous post). But professionals shooting with DSLRs need even more, with 20-plus megapixel cameras capturing in RAW plus JPEG formats, and continuous burst modes shooting five or more images per second. Plus, pros need even more rugged and durable equipment to work in difficult environments and under extreme conditions. Which explains the contained popularity of the CompactFlash (CF) Memory Card format (see Wikipedia). Yes, CF seems old-fashioned and clunky because it's so much bigger then the SD format (a whole inch and a half wide! ), but that extra size allows for a tougher metallic case (not just plastic), and more headroom in the circuitry, offering not only higher capacity and faster performance, but also increased reliability. For example, SanDisk has just refreshed its line of CompactFlash cards, featuring the SanDisk Extreme Pro CF Cards -- doubling the performance up to 90 MB/sec., and with capacities up to 64 GB. These cards are not just memory, they include processor and firmware, with the new SanDisk Power Core Controller, an advanced memory controller that enhances performance with a dual-lane architecture, and increases reliability with a 42-bit ECC engine to maintain data integrity and extended card endurance through optimized wear leveling. And the CF format allows for impressive durability, with shock protection to withstand accidental drops of up to nine feet, a RTV Silicone coating for protection against moisture and humidity, and operation over extended temperatures from -13 F (-25 C) to 185 F (85 C). So the SD card format is great for consumer cameras and camcorders, but the legacy CF format is still going strong to meet the demands of extreme shooting with DSLRs. 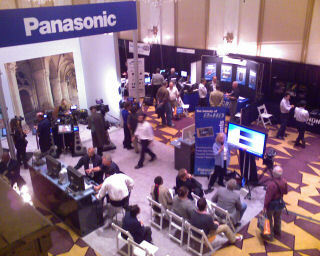 HD Expo NY came to The New Yorker Hotel in New York City last week. The show is changing its brand to Createasphere, in recognition of the broadening of production beyond just HD (... and avoiding confusion with Hospitality Design Expo). The organizers produce other related shows in Los Angeles, and are looking to expand in New York for two days next year. The event on Thursday, September 17 ran from 11 am to 7 pm, and included panels, workshops, and an exhibition. The panels included conversations with film editors and cinematographers, and a New York production industry update. These were packed, with waitlist lines, and clearly need more space next year. The workshops included Apple FCP, Canon EOS HD, HP NLE, Panasonic P2 Varicam, and RED on Adobe. Approximately 35 exhibitors in this friendly setting offered plenty of opportunities for extensive discussions and hands-on time with equipment, especially cameras (Canon, JVC, Panasonic, Sony), lenses (Carl Zeiss, Fujinon, Schneider), and related equipment such as lighting. One clear trend is the interest in shooting video with a HD DSLR camera, like the Canon EOS 5D and new 7D -- shooting photos plus short HD video clips, less obtrusively than with a video camera, and with the creative look from the choice of options of professional lenses, and especially control of depth of field. Createasphere NY reports that registrations for the event doubled from last year. The New York area clearly is underserved with these kinds of video production events -- DV Expo East is now only West, and ShowBiz Expo is long gone. We do have two events coming up on in October, the New York Post|Production Conference, a training event from Future Media Concepts (who also do training at NAB), and HD World, a two-day event of sessions and 140-some exhibitors, as part of the umbrella Content & Communications World event at Javits, combined with SATCON and IP Media Expo. Adobe has announced its annual update to its consumer digital media editing software -- Premiere Elements 8 for video (Wiindows only) and Photoshop Elements 8 for photos (Win & Mac) -- see respective press releases. The pricing is unchanged: the applications are $99 each, or $149 bundled together. The Plus versions add stronger online integration -- increasing the online storage from 2 to 20 GB, and providing ongoing updates of new tutorials, themes and artwork. The Plus versions are $139 each, or $179 bundled. The most visible change in this release is a more-integrated Elements Organizer, now a separate application for importing, organizing, and tagging both photos and video. You can rate the best clips, group clips in nested Albums, and apply Tags to clips. The next major theme of this release is automated analysis to determine the video quality, including video features, audio characteristics, and video content. And for photos, the Auto-Analyzer not only finds multiple faces in each images, but then does people recognition -- prompting you to enter the names of different people, and then finding additional matches to those faces. Of course, this analysis requires significant processing time, so the Organizer will crunch away in the background as you import new collections of media (and, by default, will continue running even if you close the application). This is similar to the background processing in Premiere Elements conforming the audio and rendering the timeline. The pay-off for this automated analysis, and your work in organizing albums and manually tagging clips, is not just a warm and fuzzy feeling. Given all this information about your clips, Premiere Elements then can be much more intelligent in performing a new level of automated editing, creating a polished movie using a specified theme, and with new assists for trimming lower quality footage, fixing shaking and lighting problems, and balancing across audio tracks. The new motion tracking also adds overaly graphics that automatically moves with subjects in footage. The third theme in the new Elements application is even stronger support for online backup and sharing though Photoshop.com. New online albums use Adobe Flash animated themes to create dynamic online presentations. And the online catalog can be used to sync media across multiple computers running Elements. Adobe describes Premiere Elements as consumer software, but the Elements applications are not for beginners. 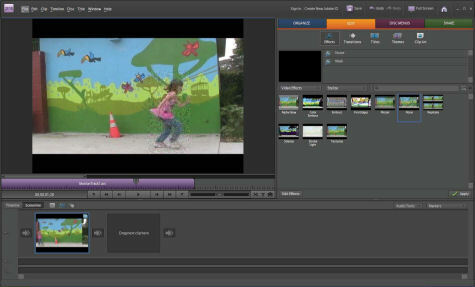 These tools actually provide a surprising depth of the power of Adobe's Premiere Pro CS4 and Photoshop CS4 professional applications, including video timelines with keyframed effects, and images with layered effects. Yes, these tools add a friendlier interface with extensive tips and tutorials, and simplified editing modes like the video storyboard and one-click photo quick fixes. But the interface is not overly simplified to just big fat buttons -- the depth is still visible in the many smaller controls and icons. The bottom line is that Adobe has designed the Elements tools for motivated enthusiasts who want to do more than a quick occasional edit. If you're the type who is organized about shooting and managing your footage, and willing to put in the effort to tag and analyzer it, then Premiere Elements 8 will help you do more, doing guided edits with the new automated assists, and then doing more sophisticated work with the depth from the Adobe CS pedigree. See my full article - Summary: Adobe Premiere Elements 8 for more on the new features and a visual tour of the applications. If you're looking for a great holiday gift for students or travelers -- or actually anyone with a computer, then check out this season's crop of portable hard drives. 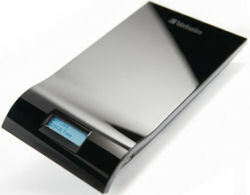 Products like the new Verbatim InSight Portable USB Hard Drive are literally (coat) pocket-sized, around 6 x 3 1/2 x 2/3 inches and under 6 ounces, and are powered through the USB connection, with no separate adapters or plugs required. But the break-through this season is in the pricing -- 500 GB (half a terabyte!) for under $150. Yeesh -- only two years ago, $150 would have gotten you more like 160 GB. So these portable hard drives make a lot of sense for people on the go with laptops, especially students and exteded travelers. You can bring along lots of data (like music and photo collections) without clogging up your laptop's internal drive. You have a stash of spare disk space when needed, especially for copying photos and videos that you've been shooting. And, you have a place to back up your system, you know, just in case. As a result, these products typically backup software, so you can back up your laptop on the road, or even use them to easily back up your desktop system, like you know you should. And we're talking hundreds of gigabytes of data here -- likely more than came with your last desktop system. That's a lot of data to go missing if your drive is lost or stolen. So these drives typically include security software (or hardware) to protect the contents though password encryption. The distinguishing feature of the InSight drive, however, is the Always On Display, a small LCD that displays the drive name and available free space -- even when the drive is powered off. You can change the displayed name by renaming the drive icon in Windows Explorer or the volume label in Mac OS. The name and available storage are then updated each time you connect or safely remove the drive. So now you can keep track of which drive is which, and which has enough free space to use for your next project. Verbatim InSight drive is available with 320 GB for $119 (more like $99 street), and 500 GB for $149 ($116 street). 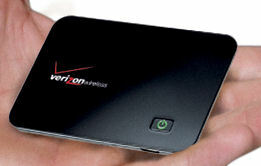 See my Portable Storage Gallery for more on portable drives, memory cards, and USB flash storage. Entries posted to Manifest Tech Blog in September 2009, listed from oldest to newest.